Your payment via PayPal or money order is your order. 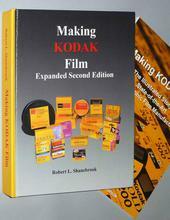 My PayPal Account is: makingKODAKfilm@yahoo.com If you provide an email address I will confirm your order. I pay the PayPal fee. PayPal requires that I ship to the address associated with the buyer's account. PayPal allows no flexibility on this. If you want shipment to another address use PayPal's "send money to a friend" service. ​I ship quickly, always within a day of payment. If you do not receive your order within 45 days from the time of payment you must notify me in order to receive a replacement. This is determined by USPS insurance policy. USPS Priority Mail delivery time anywhere in the World has not exceeded 21 days. Shipping for a second book in the same box is FREE! EXPORT USPS suggests that I put the buyers phone number on the shipping label. Please provide your telephone number. Shipping for a second book (1st or 2nd edition), shipped in the same box, is FREE. Buy one for a friend. USA: $7.50. NYS addresses please include sales tax on total amount. ​If purchased with a copy of the 2nd edition shipping for the 1st edition is free.